New to Rapid Recovery 6.0.2, is the option to enable Deferred Delete in Nightly Jobs. This is listed as a new feature in Release Notes, but was not included in the User Guide documentation by mistake. Full details will be included in the next User Guide. In the mean time, here is description of the new feature and how to enable it. Selecting Deferred Delete in Nightly Jobs, starts a "Deleting records previously flagged for deletion" parent job for each repository on the Core. While the job runs, all activity for Agents in the repository are paused. Only Deleting index RPFS (Recovery Point File System) file child jobs run. By default, the Deferred Delete option is not enabled. If enabled, the default Maximum execution time is 04:00 (hh:mm). The Maximum execution time can be changed. "Deleting records previously flagged for deletion" parent job begins after all preceding Nightly Jobs have completed. All Agent activity is paused for the duration of the job. While the job runs, only "Deleting index RPFS" file child jobs are ran. The job runs until all Deleting index RPFS file child jobs have completed or the Maximum execution time has expired, which ever comes first. At the end of the job, all Agent activity is resumed. Select Nightly Jobs and click Change. The Nightly Jobs window will appear. 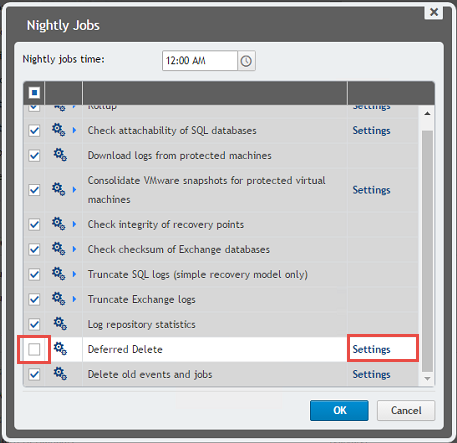 In the Nightly Jobs window scroll down to Deferred Delete and select it. NOTE: The default setting for Maximum execution time is 4 hours. If you wish to change this value, click Settings. In the Configuration windows change the time, and click Save when done. Note: enabling Deferred Delete in Nightly Jobs mean that Core is having dedicated time for deferred deletes, blocking all other jobs from happening. This also means that for the rest of the day, Core will not perform background deletions even when idle.